As a Lucio main who offclasses Soldier 76, I’m pretty immune to the whole Overwatch concept of “competitive checks and balances”. Both of my mains are stupidly adaptable with self-healing, self-defense, mobility, and easy-to-use firearms rounding out their generalist kits. No matter who I’m fighting on the other team, its rare for any opposing hero choices to really cause me much difficulty beyond forcing me to play passively and maybe preventing me from easily doing my job. And then there’s this mother♥♥♥♥er. Roadhog counters both of my mains so badly that he’s now my tertiary main, for no reason other than to improve my ability to not die to him. Every six seconds he gets to fling his hook out and delete whatever poor squishy gets dragged into his blunderbuss’ welcoming barrel. He’s also the only tank with no armor whatsoever, relying entirely on his 600HP and self-healing radioactive drink to tank damage. He honestly plays a lot more like a DPS than a tank, but don’t let that fool you into underestimating him; he’s a scary force on the battlefield, and his mere presence is enough to zone entire chokepoints due to the ease with which he can punish peeking. 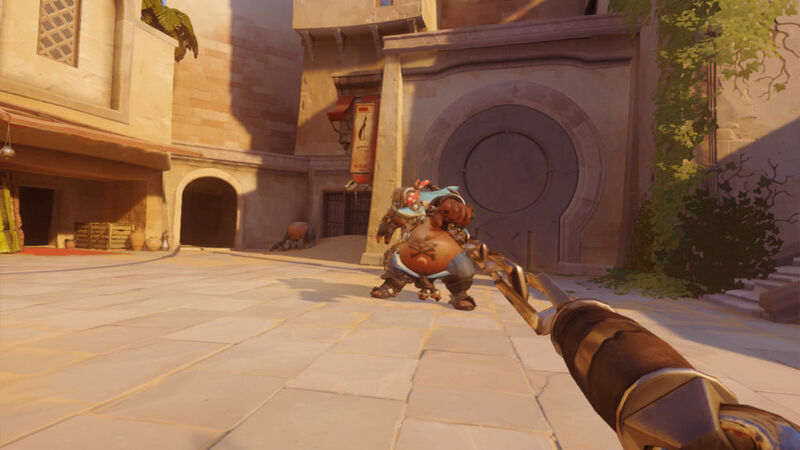 The magic combo for becoming a good Roadhog is: hook —> primary fire —> melee, which deals over 200 damage before your opponent even recovers from the hook’s stun. For high-health enemies, throw in an extra blunderbuss blast on either side of that combo to soften them up for the kill, and there’s not many characters who can walk away in one piece. There’s also an important note about fighting other Roadhogs: Whoever hooks first loses. Counter-intuitive, which is why I’m calling it out and linking to video evidence, but it’s proven absolutely true as I’ve worked on elevating myself from amateur to halfway-proficient. Another skill I’ve learned about fighting Roadhog involves dodging his hook. As I mentioned in this article, if you find yourself facing a Roadhog the worst thing you can do is telegraph your movements, because that hook is hungry. Instead, feign one direction and then quickly switch so that he flings it the wrong way. I’ve saved my own life countless times by baiting hooks, mainly due to playing classes who have no other chance of survival when coming face-to-face with the gas-masked behemoth in an open corridor. How to dodge a roadhook. We may have lost, but I should have been dead. His role in competitive is…interesting. 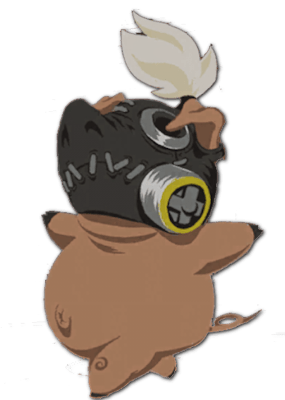 In a world where the pros have ruthlessly calculated every hero’s effectiveness down to very rigid metas, Roadhog is not the most effective character at getting his normal jobs done, and he fills a completely different role from the world of pubs. At the highest levels, Roadhog is selected specifically to nullify enemy ults, either by hooking them (which instantly ends most channeled abilities) or by popping his own ult and keeping the threat pinned to the ceiling with Whole Hog (this works especially well against Nanoboosted enemies). For me, its taken some time to get a handle on Roadhog because he’s so different from my normal style of play. Lucio and Soldier are both backline fighters with high-accuracy ranged weapons, and then this lumbering shotgun-wielding fatso can’t even speed himself out of respawn. But even as mediocre as my play currently is, I can see the potential and the possibilities he has to swing a game in his favor. Roadhog exists to punish enemy mistakes, but in turn he can be very unforgiving when his player doesn’t hit the right buttons at the right time. I need to shed my habits and inhibitions to embrace his unique playstyle. I need to be free as a pig.